AllTrac.net • View topic - Anyone have a charcoal canister check valve & jet? Anyone have a charcoal canister check valve & jet? I've almost completed the charcoal canister connections since purchasing the correct water outlet with a BVSV. . now I just need these two pieces and I'll be done. I can get them new (the jet I've found online but the check valve I'm unsure of) and may have to but I was hoping someone may have these laying around and can part with them. In case anyone may wonder. . It may seem like a lot of trouble to connect something most discard (I assume at least). I'm wanting to connect this system because there have been times when I could smell gas fumes from the engine bay. I also have a natural gas water heater in the garage. . directly in front of the Celica. Last edited by FC Zach on Mon Dec 03, 2018 6:56 am, edited 1 time in total. 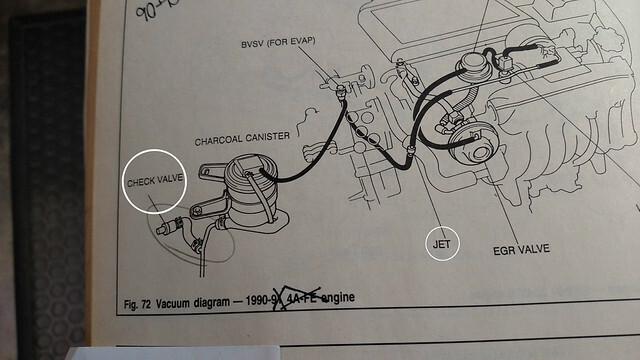 Re: Anyone have a ccharcoal canister check valve & jet? Re: Anyone have a charcoal canister check valve & jet? I might have that piece. Its probably still attached to my canister I removed. I'll check later at work right now. Hard part will be finding what box it's in. FC Zach wrote: In case anyone may wonder. . It may seem like a lot of trouble to connect something most discard (I assume at least). I'm wanting to connect this system because there have been times when I could smell gas fumes from the engine bay. I also have a natural gas water heater in the garage. . directly in front of the Celica. I need to have mine because of California, else I have to pay the big bucks. r-town wrote: I need to have mine because of California, else I have to pay the big bucks. With all that being said, it's not like I'm driving a modded diesel that's rolling coal. . Although I have zero cats, no EGR, and only pass visual because 'I know a guy'. . The test is always a pass. Hell, the car practically shits daisies according to their test machine I don't how but it does. California labels my ST185 as a gross polluter. Right now is non-op, but last time I took it to the smog test center the guy literally did an EGR vacuum test to make sure it operated properly. Since its AWD, they simply do the sniff test + visual inspection. I think I have it somewhere, when do you need it? No rush, whenever convenient for you. FC Zach wrote: No rush, whenever convenient for you. That would be great! I think Magroo is checking for them. . If I get these pieces from him before then, I'll let you know. Thanks! FC Zach wrote: That would be great! I think Magroo is checking for them. . If I get these pieces from him before then, I'll let you know. Thanks! Sorry Zach I completely forgot to check on those parts. I'll write myself a note to check on Thursday while I'm doing maintenance on the snow blowers. No snow yet, but it's not far off. Need to make sure they fire up when needed.